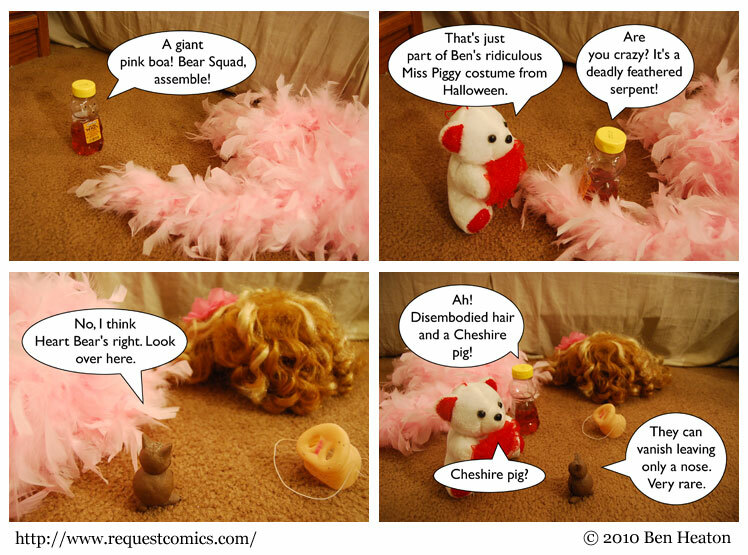 A comic in which a pun on the words 'feather boa' is used. Perhaps the bear squad can think it's a snake and defeat it. I wasn't sure I'd have any use for that after Halloween. Fortunately, any object can be made useful through the right requests. Speaking of useful objects, this weekend I picked up a Darwin Carmichael is Going to Hell tote bag, a whiteboard version of Dinosaur Comics, and a bunch of comics. NEWW was wonderful all around — it's a careful selection of the parts of a comic convention I care about, separated and enlarged to a full con of its own. Anyway, now that it's over, I'm heading down to New York for a couple days, and then it's back to DC. Update your maps of my location accordingly.